A Painter's Passage: Where Do We Come From? What Are We? Where Are We Going? At the age of seven I knew. I stood in front of Claude Monet's "Poppy Field in a Hollow near Giverny". At the age of fifteen, I fell in love with Gauguin. 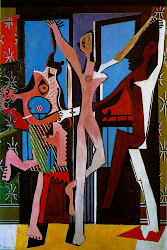 Then with Picasso and Klee and Chagall. By the age of seventeen, I had fallen in love so many times I stopped counting. I had found my Tribe. Sometimes backward, sometimes forward, sometimes sideways, always onward. Always on the path. 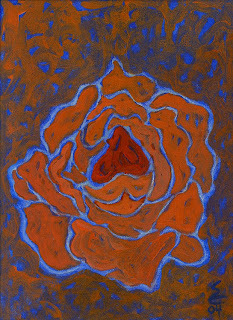 Morocco Rose, Acrylic on Canvas, 12" x 9"
This Post Title is borrowed from Gauguin. Hi Sharon! Thanks so much for your nice comments. Hey, I get to be your first "commentator". I daydreamed thru my youth with the aid of the Impressionists. I thought all those landscapes had to be the prettiest places on earth. I like your vibrant piece. Is it oil or pastel? I've just met a friend. Thanks for your comment. I will follow your blog with interest, as I hope you may follow my infrequent posts. Your words give me chills of memories ... thank you for the reminders of where we are, where we've been, and where we may go. Sharon, I look forward to following the journey. Every blog had their first post, here is to many, many more. Hi Stephanie! I really enjoyed seeing your work. I'm glad you got to be the first! We obviously shared very similar daydreams! The piece here is painted with acrylics. I love oils but I've always been too impatient to wait for their drying times. Hi Jennifer! Yes, I felt the same way reading your post. I will be looking forward to following your posts. And I will subcribe as soon as I figure out how to do that! I am new to the blogging world. Thank you, friend. Thank you, Postcards from Detroit, for your kind words. I will be following your work also...as soon as I figure out all these links! Hi Sharon, thanks for passing by on my blog and your kindly comment. Nice intro, especially about Monet's painting. Looking forward to your posts. Hi Cerulean, Happy to hear from you. I just found your blog and really like your work. Inspiring. Can something be deep and light at the same time? I am looking forward to seeing more of your work. Thank you for your kind words. Hello Amy! Welcome aboard. Always nice to meet another Journeyer.